Rob and Tina: We’re still happy to teach full day workshops and full weekends as a couple. When you book both of us, you get our toddler as a bonus (she’s very cute). We’re accustomed to teaching with her in the room and so far everyone seems to really enjoy having her in class. If you have someone in your scene that would enjoy helping keep the little one entertained it makes everything a little bit easier for us but it’s not a necessity. If the event involves evening social dances and/or competitions we may need to leave a bit early or divide and conquer but we’ll be there to dance with everyone as much as possible. Other than that our needs with regards to travel, accommodation, food etc are no different than what you would expect for other teaching couples. We’re really excited to be teaching for the third time at Brighton Balboa Festival on 20th – 22nd October alongside Dan & Gemma Guest and Katy & Alistair McGrory! There are couples tickets as well as leaders tickets still available. It’s always a really nice weekend, so come and do some balboa with us by the seaside! LSX 2017 – individual day passes on sale! Bookings are open for Leeds Swing Exchange 2017! Click here to visit the website and book now! 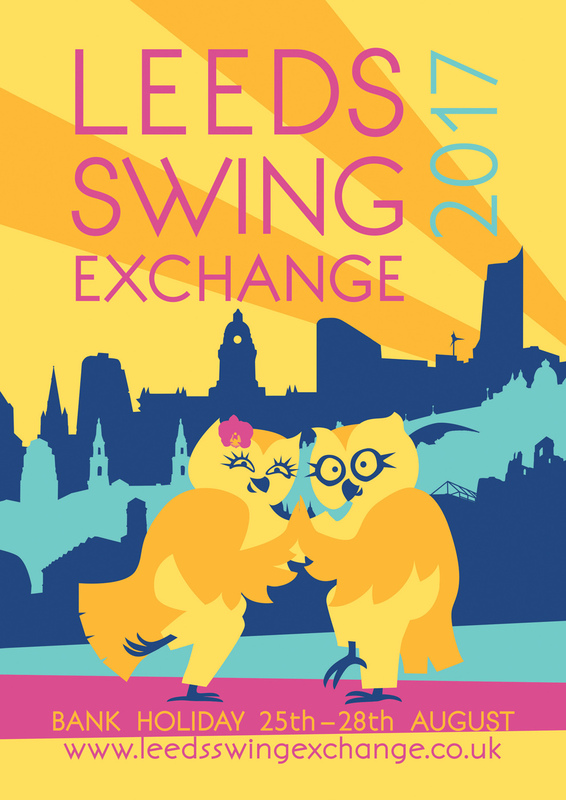 Leeds Swing Exchange is an annual weekend of purely social dancing and other activities for swing dancers of any level. It is happening this year on the August Bank Holiday 25th – 28th August 2017! Your full weekend ticket includes four days of dancing in some of Leeds’ most iconic and beautiful venues, four fabulous live bands, two late-night afterparties, a mountain of cake as well as loads of other fun non-dancing activities! We believe that social dancing with lots of people is definitely the fastest way to improve, so even if you’ve just started, if you’re in Leeds, you should be at Leeds Swing Exchange! In the meantime, happy hopping! Filed under lindy hop, What's On? Bookings have now opened for Leeds Swing Exchange 2017! Click here to visit the website and book now! It is happening this year on the August Bank Holiday 25th – 28th August 2017! For the Early Bird price of £60 (£50 unwaged), you will get four days of dancing in some of Leeds’ most iconic and beautiful venues, four fabulous live bands, two late-night afterparties, a mountain of cake as well as loads of other fun non-dancing activities! Last chance to book our Balboa Basics Course for 12th April!